Week of May 12: Using a shovel, I turned the old soil, dug out dead roots and other debris and let it “breath” for a week. Cultivated soil: Poured 5 bags of “topsoil” rich in composed in my vegetable bed and using a rack mixed it with the old soil and created a leveled surface. At least 8 cm of cultivated soil on top of the bed. Seeds or seedlings? Save for a few kinds of herbs, I always go with seedlings because they mature much faster and easier, plus they are quite inexpensive (12 small, for $5) In any case, now is a little late for starting from the scratch for many types of vegetable. So let’s go with seedlings. But be careful where you buy them from, as the quality varies a lot: I never buy them from supermarkets; nursery is the right place to buy seedlings from, in my opinion. 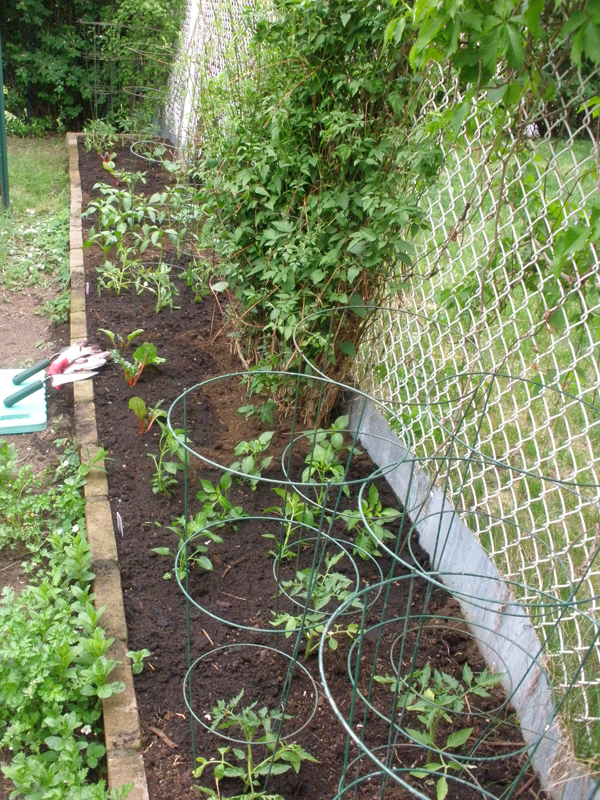 Planting: This year, I planted hot and sweet peppers, tomatoes, cucumbers and rhubarb. 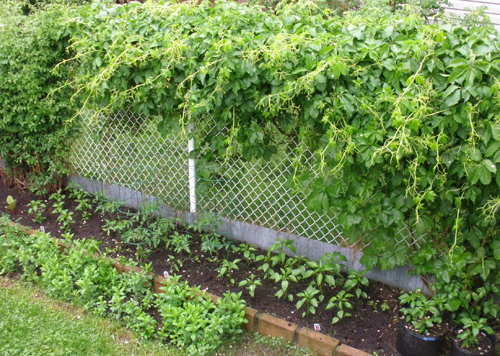 The instruction for spacing these vegetable plants is all over the net. Do not go too packed, but you could plant them a bit more packed than usually recommended. For tomatoes, make enough in between seedlings to allow one cage to go around it (which is absolutely necessary). For peppers about 10 cm apart. Peppers grow perfect in containers by the way. See here for the tips I gave last year. Cucumbers need at least 20 cm space on each side and they should be planted by a supporting stick each. Always plant during the early morning hours or in the evening; never under direct sun. 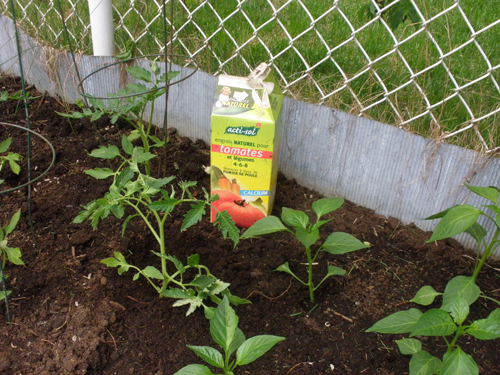 Add vegetable fertilizer at the outset; Water thoroughly immediately after planting. Once all vegetables are nicely planted in a dark brown, clean and rich soil, all in line and full of life, you can sit back and enjoy your brand new creation and let the summer-long process of anticipation and joy begin! By no means is your hard work over, once the planting is accomplished. Actually your labour has just started! 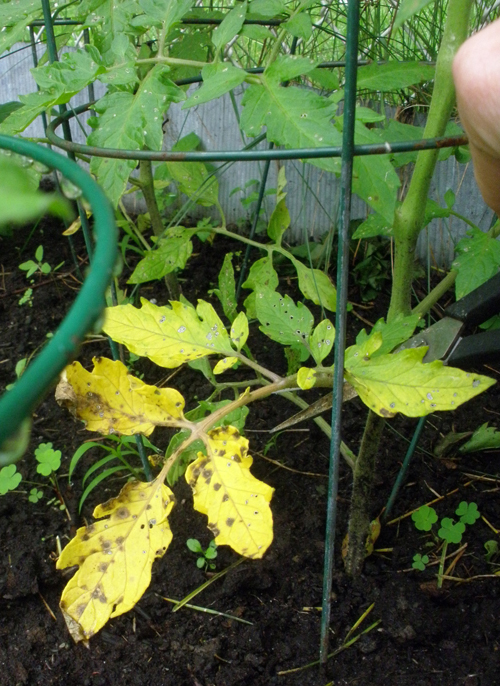 Pest-controlling: If you know your yard and garden to be affected by pests, don’t wait to see the damages on the leaves before using pesticides. 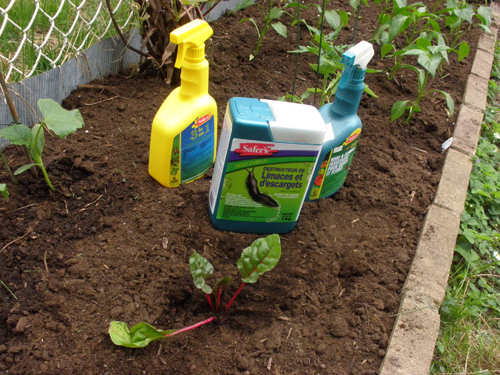 Start pest control from the beginning by identifying the pests and applying specific pesticides – Again, always applying them early in the morning or in the evening. Unfortunately “natural” or botanic pesticides are expensive and not as effective, in my experience. But you could try them if your garden is not infested by pests. Water when the soil is dry, and do not over-water. Groom occasionally by removing dried or yellowed leaves. 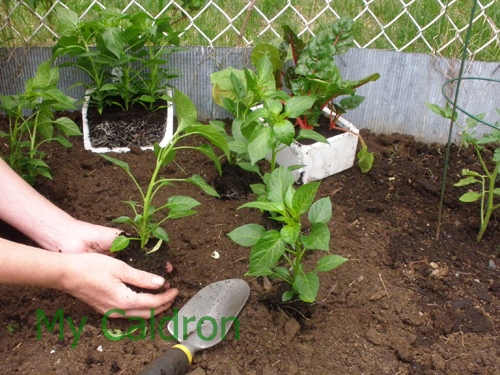 Happy gardening everyone and drop by here with your tips and questions. They have grown about 30 cm – Time to cut the lower yellow leaves to help its growth. Also, I am regularly cutting off any damaged or yellow leaf I see anywhere on any plant. 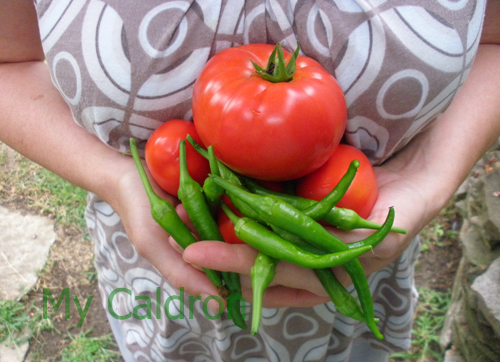 30 June, my first harvest of the season, or almost there! Hot pepper, tomato, cucumber, beet leaf and my first batch of home-grown delight, containing: mints, parsley, leek, basil, tarragon, and rosemary. 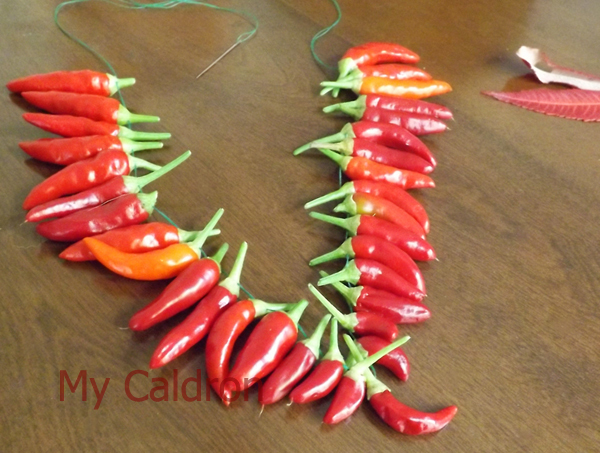 August: My very HOT necklace for the upcoming winter days.